I’ve always considered myself a better baker then cook; maybe it had to do with the exactness that is inherent with baking. So if you needed cakes or cookies, no problem. But bread, well that is another story. Can I make bread, yes. Does it taste, how that style of bread is supposed to taste, sometimes. 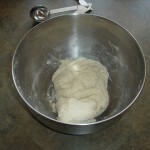 With baking bread I’ve had very good luck making pizza dough, pretzels and bagels. 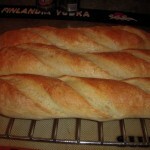 So why not step up my game, and make one of my favorite breads, french baguettes. 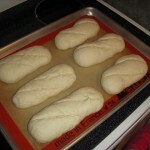 The whole idea of making french bread happened while I was making a sandwich with an Italian hoagie roll. I was looking at the hoagie roll, and realized that I was in a bread rut, and I needed something different. And with that I started to scour my cookbooks and the Internet for a french bread recipe. While there happened to be a lot of options out there, more then I initially thought. So where to even start this bread journey? 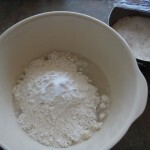 Why none other then the King Arthur Flour Co website, whose recipes I’ve used with much success in the past. 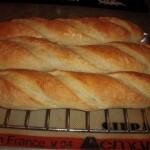 After surfing through their site I ended up using the KAF Classic Baguettes and Stuffed Baguettes recipe. 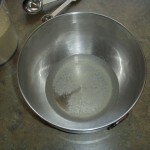 By the time of me writing this post, I have already made the recipe 3 times and come to a couple of conclusions. 1) Do yourself a favor and let the poolish ferment for as long as possible. The first couple times, I would let it ferment on the countertop for 12 or 24 hours. But the third time, I let it ferment on the countertop for about 12 hours, and then I put it in the refrigerator for at least another 24 hours. The only reason I mixed it up on the third attempt was that I had to go to a dinner party, so I couldn’t make the baguettes after the 12 hour rise. 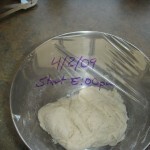 Hence putting the poolish in the refrigerator, since I knew the cold temperature would slow down the fermentation. The baguettes that had a poolish with only countertop time seemed to have a more pale color, and reminded me of Italian loaf. While the baguettes with the two stage poolish had better color and crunchy crust. 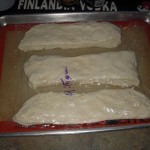 2) Don’t make 3 regular baguettes make 6 petite baguettes instead. If you’re going to be using the baguettes for garlic bread or burschetta then make the regular loafs, since more then likely you will be using a whole loaf for the dish. 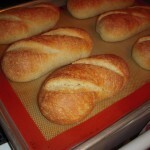 But if you plan on using the baguettes for sandwiches or french bread pizza, then make the petite ones. The first two times making baguettes I noticed that after you cut open the regular baguette, and tried to save the rest. That the baguette goes stale very quickly, after that initial cut. So if you make the petite baguettes, you can basically use a whole mini loaf for the dish, while keeping the rest completely intact. 3) You need a water spray bottle. Since I don’t own a professional steam oven, I need to do a little bit of jury-rigging to come close to the results of the professionals. This is done three ways. -Before you put the baguettes in the oven, mist all the unbaked baguettes with water. 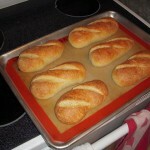 -As you are putting the baguettes in the oven, spray some water in the oven to develop some steam. -And after you pull the baguettes out of the oven, mist all the baked baguettes with water. The first two water applications are an attempt to replicate a commercial steam oven, which helps to develop that crispy crust that makes french bread so delicious. But the third application I learned from my sister the baker. When the mist water on hot bread (bagels, baguettes, etc.) after pulling them out of the oven. 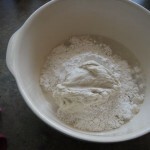 It’s that after baking misting that creates the glossy sheen on the crust of the bread. 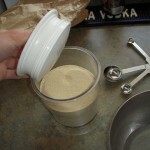 4) This recipe requires a lot of time but very little labor. When you read through the recipe on the KAF website, you probably see all the time required in the recipe and say to yourself. 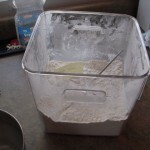 “Over 24 hours to make bread, I don’t have that kind of time.” Well the times can be deceiving. Since the actually physical labor involved is less then 20 mins. Most of the time in the recipe is for rising and relaxing, so here is a quick breakdown of the time involved. 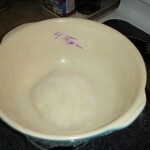 7:00am (2 minutes) – Make the poolish, and leave on countertop. 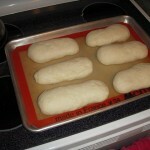 8:40-9:10pm – Hot bread ready to pull from the oven, and put into you belly. So what are you waiting for, give it a shot. You might be pleasantly surprised with the goodness that can come from you own oven. Hi, good post. I have been thinking about this topic,so thanks for posting. I will certainly be coming back to your blog. Yeah, send it my way. But I seem to be in the same boat as you about making leavened bread. I want to get good at it, but all I keep turning out sub-optimal products. Pizza dough, pretzels and Bagels, yeah I’ve got that down pat. 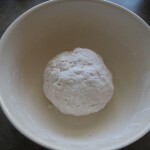 But so far I’ve had weak results with pita bread, sour dough and whole wheat bread. Like you said, try and try again. Did you see the Cook’s Illustrated take on this? I can send it over to you if you have interest. I have been trying bread recipes recently to little success, It’s my current culinary goal to be come proficient at yeast leavened breads. Hopefully better end product will come out of the trying.